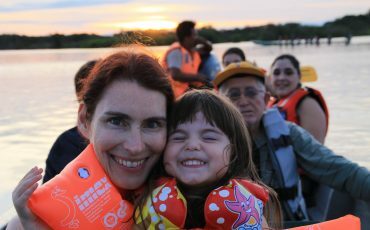 The perfect tour to Ecuador for kids and their parents. 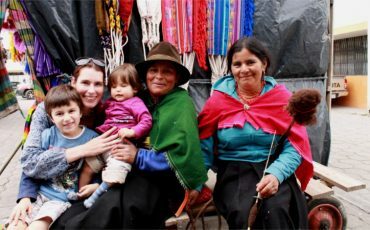 In 10 days you can discover the capital Quito, the fake and the real equator, see many hummingbirds, shop on an indigenous market and live a real adventure in the Amazon rain forest. Comfortable and kid-friendly hotels, a cool guide who knows all kinds of fascinating stories, and many amazing experiences await you. 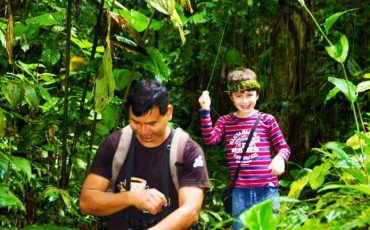 This “Ecuador for Kids” tour offers a great combination of the Highlands and the Amazon. 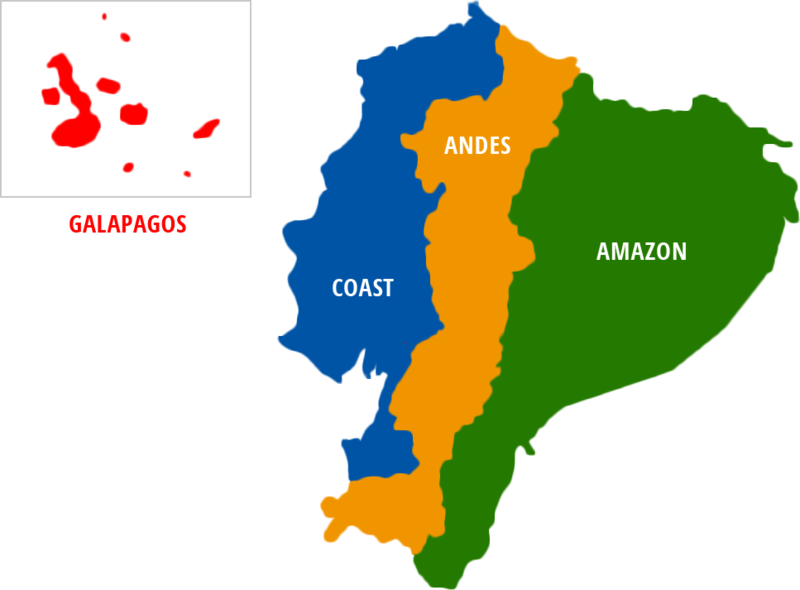 Also check out our “Galapagos for Kids” tour, which would be the perfect extension. Upon arrival in Quito you’ll be met and transferred to your lodging for your first night in Ecuador. The Hotel Patio Andaluz, placed in a colonial-style house from the late 16th century, with large arches and interior patios, is located just a short walk from the renowned Church and Plaza de San Francisco and certified for its excellent work in sustainability by Rainforest Alliance. Start the day’s activities with a visit to Quito’s colonial city center. On a walk around the old town, your guide will show you some of the most beautiful buildings and churches. There are some churches that almost sparkle, because there’s so much gold in them. The street La Ronda is closed for traffic. Here you can visit many small stores that sell locally produced clothes, accessories, toys, sweets, and all kinds of knick-knacks. Be sure to try the ice cream! From La Ronda you can already see the “Panecillo”, a hill with an angel on top (it’s actually the Virgin Mary, but with wings). 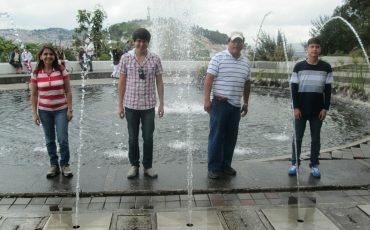 Your guide will take you up there and you will have an amazing view and see how large Quito really is. If you’re lucky and the weather is good, you can even see snow-covered volcanoes in the distance. In the afternoon you visit a really fun place: The “Middle of the World” (Mitad del Mundo in Spanish) is the place where the equator crosses. There’s a big yellow line on the ground, so you can’t miss it. There’s just one problem: almost 300 years ago some French scientists spent a lot of time and effort trying to find the equator. Sadly they didn’t have GPS, so they missed it by a short distance. But no worries, directly on the real equator, right around the corner from the fake one, there is a small museum. Here you can prove that you are really right on the equator with some experiments that include eggs, water, and you with your eyes closed. After this visit you continue towards Mindo in the cloud forest. Your hotel is a comfortable wooden cabin a bit outside of town. Why is the cloud forest called cloud forest? Just observe the weather and you will know: A typical day starts sunny and warm, but then in the afternoon the clouds come in. They are so low that they seem to be a part of the forest. The humidity they bring has made the cloud forest so very green and so very full of interesting animals and plants. 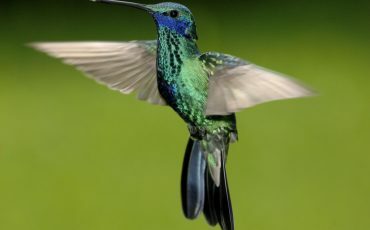 You will see, for example, many different types of hummingbirds. Some have strange names (like “Buff-winged Starfrontlet” or “Black-tailed Trainbearer”), but all are colorful and pretty. It is a real challenge to take their pictures, because they don’t like keeping still. 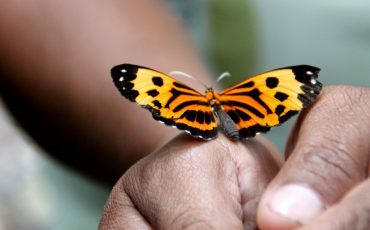 For more colorful animals, visit the butterfly farm. You can learn about the process from caterpillar to butterfly and see many different species from up close. Some might even come to sit on your hand, if you’re patient. Do you love chocolate? Do you know how chocolate is made? Have you ever tried a cacao bean that was just picked from a tree? The chocolate tour shows you how chocolate is made. Be sure to try the result, it’s delicious! Your next destination is Otavalo. It’s the name of the town, but also of the local indigenous population, who are called Otavaleños. For a long time, Otavalo has been famous for its beautiful woven fabrics and other handicrafts. Of course many people came to buy these things here, or trade with the Otavaleños for things they didn’t have. That’s how the local market started. Today, Otavalo’s market is one of South America’s most famous indigenous markets. 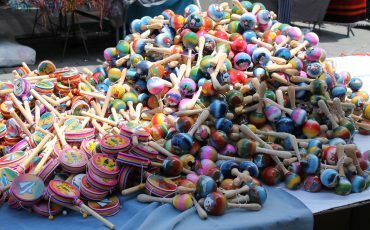 Every Saturday many people from Otavalo and the surrounding villages come to the town center and offer their goods. You can find hammocks, clothes, hats, musical instruments, jewelry and toys, all produced locally. If you can’t make it on a Saturday, don’t worry: the market is every day, just not as big. Your hotel for the night is a historic hacienda. A hacienda was basically a huge farm. The owner and their family had a huge house (where you will now sleep), and the local people had to work for them. The Andean Condor is the largest flying bird in the world! Close to Otavalo there is a park dedicated to these giants: The Parque Condor rescues condors and other birds that are hurt and tries to educate people about the condors. You can visit the birds and observe the flight show, which is twice per day. Also close to Otavalo is a huge waterfall called Peguche. For the Otavaleños this is a sacred place where they come for cleansings, bathing in the cold water. There is a local legend which tells of a huge pail of gold in a cave inside the waterfall. Be careful if you try to find it: two giant black dogs are guarding it. For the night you go back to Quito and sleep close to the airport. That way you don’t have to get up too early the next day for your trip to the Amazon. 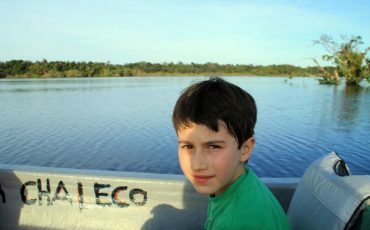 An absolute highlight when talking about Ecuador for kids is the Amazon Rain Forest. Start your adventure at the Quito Airport. Your flight is very short, but super interesting: when you start, you can see mountains covered with snow. And then, after only a few minutes, you can suddenly only see green, and more green, and a bit of brown (that’s the rivers). Were you cold in Quito and put on a sweater or a jacket? As soon as you get off the plane in Lago Agrio you will wish you hadn’t. It’s hot and humid and you will probably start sweating. But the strange climate is totally worth it, because the next few days will be filled with adventure. In Lago Agrio (that’s a town that still looks pretty normal, no monkeys jumping around or crocodiles waiting for tourists) a driver will meet you at the airport and you will travel by bus to the first part of the trip. You will see small villages where people grow bananas, plantains (like bananas, but you have to cook them), cacao (to make chocolate), pineapples, and coconuts. Finally you reach the end of the road. Here you change from bus to motorized canoe. In about two hours you travel slowly along the narrow river. Be sure to have your camera ready (bring binoculars if you have some!) and look at the trees! Do you see them moving? – Surely there’s a group of monkeys jumping around in them. Hear loud screeching? – There will be some parrots flying over your head. Is it a sunny day? – Look for caimans (kind of like crocodiles), anacondas (giant snakes), or turtles sunbathing on the river banks. When you see the forest opening up and the river becoming a lake, you have arrived! This is the Laguna Grande, the Great Lake. Right on its shore is your lodge. Check out your room, get in your bathing suit and get ready to jump right into the lake. It will be very refreshing after the long day of travel. 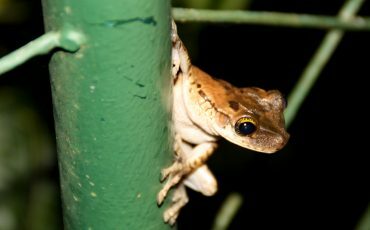 At night you will be amazed by the sounds of the jungle: you might hear insects chirping, night birds singing, monkeys howling, or rain falling. But don’t worry, you’re safe in your room, under your mosquito net. Get up early for one last tour of the jungle before breakfast (if you want). Then it’s back to the big city: first by canoe, then by bus, then by plane. In Quito, you will spend one more night close to the airport. 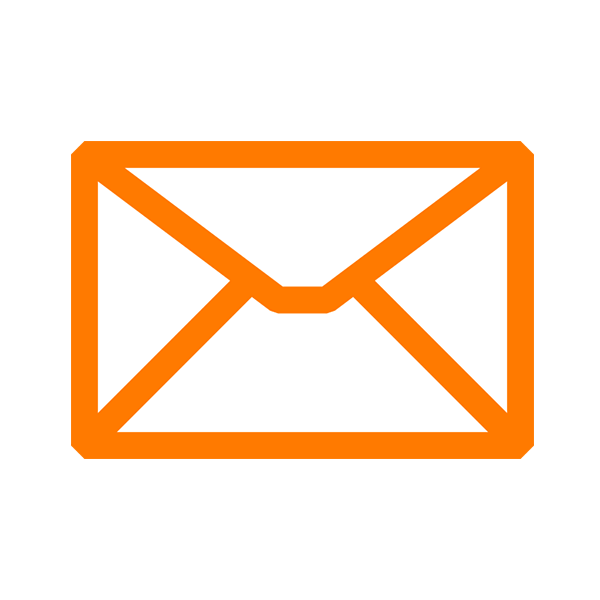 Single supplement fee: USD $390,-p.p.